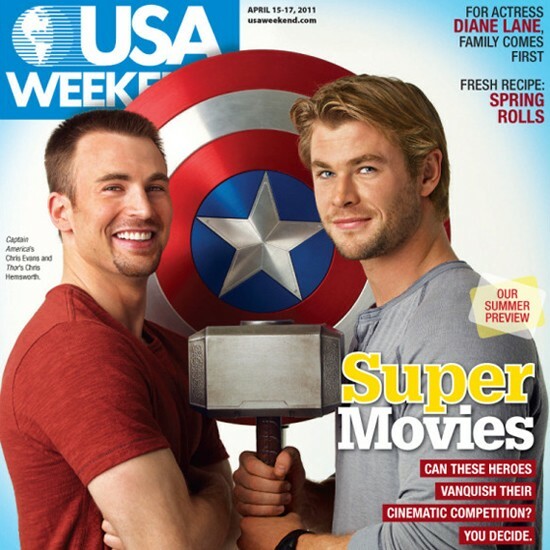 Reality by Rach : Chris Evans and Chris Hemsworth Cover 'USA Weekend': Who Knew All That Muscle Could Fit on One Page?! Chris Evans and Chris Hemsworth Cover 'USA Weekend': Who Knew All That Muscle Could Fit on One Page?! Both of these buff guys graced the cover which will consist of the Summer Movie Preview which include their films, Captain America: The First Avenger and Thor. On the fun cover the two show off their guns and as well their other weapons like their shield and hammer! All in all it gets ya pretty pumped up for those Summer blockbusters! What do you guys think? ?